1. Which comic device does the cartoonist use to make his point? Explain your answer. 2. 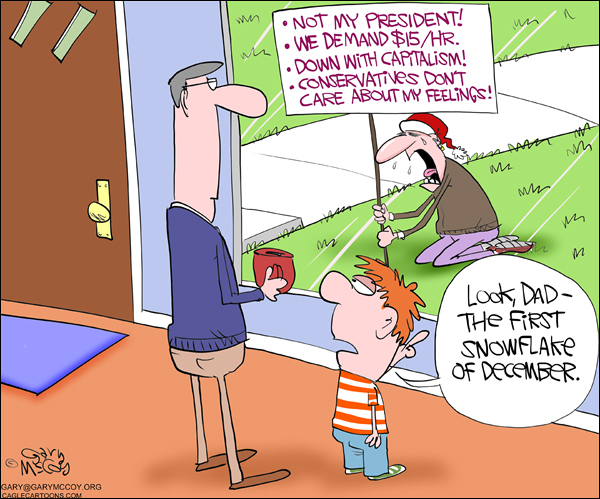 Define “snowflake” as used in this cartoon. b) parody – known by also as a spin-off or spoof, a parody is an imitation of another’s work, usually in a humorous way to poke fun at the original work. Usually, for a better effect, a parody makes fun of a famous or well-known piece of work, so the audience has a better chance of recognizing the original. c) personification, which is a figure of speech in which human characteristics are attributed to an abstract quality, animal, or inanimate object. e) caricature: A description or characterization that exaggerates or distorts a character’s prominent features, usually for purposes of mockery. For example, a cartoon of a gaunt Abraham Lincoln with a giant top hat, a very scraggly beard, and sunken eyes could be considered a caricature. 2. Urban Dictionary describes a snowflake as “an overly sensitive person, incapable of dealing with any opinions that differ from their own. These people can often be seen congregating in “safe zones” on college campuses”.